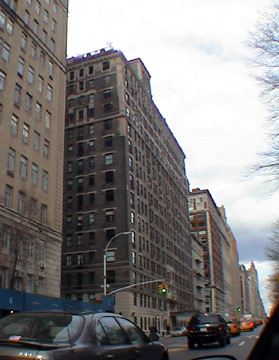 One of the older and more dignified buildings along Central Park West, this is also one of the largest in number of dwelling units. The 15-story building has 361 units. With its dark brown brick facade with Italianate detailing, handsome watertank enclosure and limestone base, this is an elegant and conservative neighbor to the great Beresford Building immediately to the south across 82nd Street. Built in 1910, the building was converted to a cooperative in 1984. In addition to its spectacular views of Central Park, the building offers an extremely convenient and relatively quiet location. It is one block north of a subway station and crosstown buses. It has a doorman and a large, handsome entrance marquee, but no garage, no health club and no sundeck.